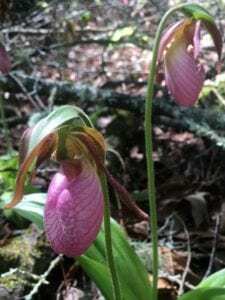 Pink lady’s-slipper is a fairly rare spring wildflower in the Great Smoky Mountains National Park. 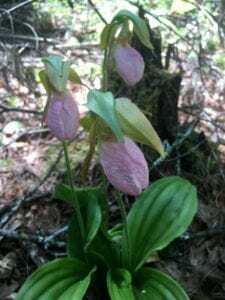 The blossom has a pink inflated pouch (“slipper”) & two large basal leaves that are strongly ribbed.It is a member of the orchid family & grows to up to 18 inches tall. Witnessing these amazing wildflowers in bloom is a truly exhilarating experience!